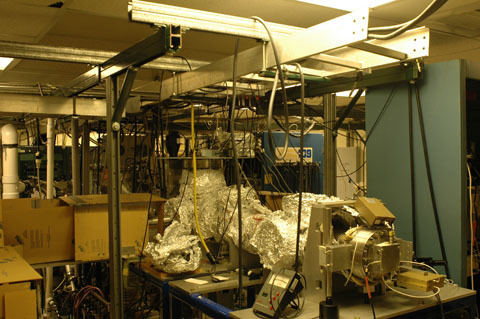 Machine A was the first apparatus in the Continetti lab, and has been recently rebuilt with a new electrosoray ionization source to study large, and multiply charged anions. Current work focuses on the oxolate anion, and the oxolate-oxalic acid dimer, as a gateway to studying the energetics and dissociative photodynamics of the dicarboxylate dianions. Machine A has previously been used to study the dissociative photodetachment of O4-, dissociation dynamics of the triplet states of ozone and in studies of organic anions and radicals. 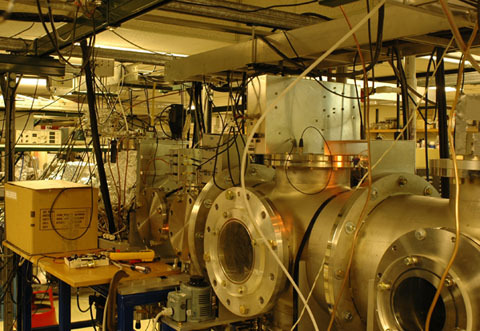 In order to study these larger anions, machine A has been fitted with a new electrostatic linear accelerator, giving acceleration potentials up to 60keV, improving the neutral detection efficiency considerably. Once the precursor anions are mass selected by time-of-flight they are irradiated by a pulse from either an Nd:YAG or Ti:Sapphire laser system. Machine A can detect one photoelectron and up to three neutral photofragments in coincidence from each laser-ion beam crossing. Both detectors record time-of-arrival and 2D position data, from which the full three- dimensional velocity distribution of the photoelectrons and the photofragments can be recreated. If you would like to see some references for the work done on this apparatus, please go to our publications page. For a general description of the work done on this type of machine, please read Reaction Dynamics of Transient Species. Shown above is a picture of the A machine. The sections visible are (from right to left) the source, the acceleration region, the time of flight region. The detector region is barely visible but can be better seen in the picture below. More photos of Machine A can be found in the photo gallery.